← Winners of the 2016 Restaurants Association of Ireland Awards. According to the Central Statistics Office (CSO) there is an increase in 16.6 percent in the overall number of foreign visitors taking vacations in Ireland between January and March compared to the same period in 2015. The welcomed figures show that the first quarter of 2016 was the busiest ever for Irish tourism with the best ever month of March also recorded. The largest increase in visitors came from North America, where numbers increased by almost 25 percent to 238,000 trips to Ireland taken according to the CSO’s Overseas Travel survey. Additionally Failte Ireland CEO Sean Quinn has also claimed that the figures bode well for the upcoming peak tourist season. “Today’s figures signal a continued strong performance by the tourism sector, reflecting a very successful St Patrick’s festival and an earlier Easter,” he said. “These trends, along with current confidence levels within the sector, indicate a strong summer season ahead but we must keep competitive and avoid complacency to maintain current growth rates,” he added. 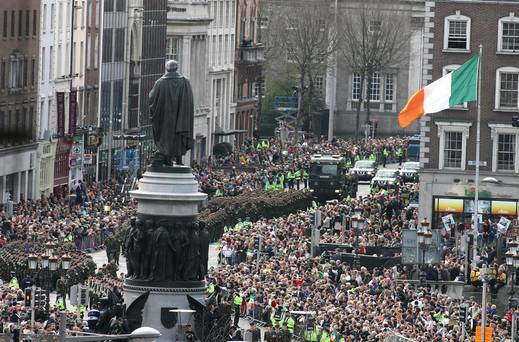 The 1916 Commemorations is just one of the reasons given for the rise in tourists visiting Ireland in the first quarter of 2016. The strength of the US dollar, the 1916 centenary celebrations and the lure of the St. Patrick’s Festival were factors contributing to the growth in the number of North American visitors. The number of visitors from the UK to Europe continued to grow over the same period whereby residents from the UK took 851,700 trips here- an increase of 17.3 percent. The number of visitors from a range of countries in Europe increased by 14.1 percent to 600,100 trips. The majority of these visitors were found to have flown into Dublin Airport, looking to sample some of the Dublin city restaurants as well as its many sights and attractions which make this capital city appealing. Separately it was also found that the number of Irish residents taking a Winter & Spring break abroad also increased by 13.1 percent to 1,476,900 trips this year compared with the same period in 2015. This entry was posted in 2016 Easter Rising Commemoration, Activities in ireland, Best Attractions in Ireland, Festivals in ireland, Flights to Ireland, Fly to Ireland, Ireland, Ireland Travel, Ireland vacations, Ireland Vacations 2016, Restaurants ireland, vacation to Ireland, Visitor Attractions and tagged Ireland vacations, Rise in visitors to Ireland, visitors to Ireland. Bookmark the permalink.